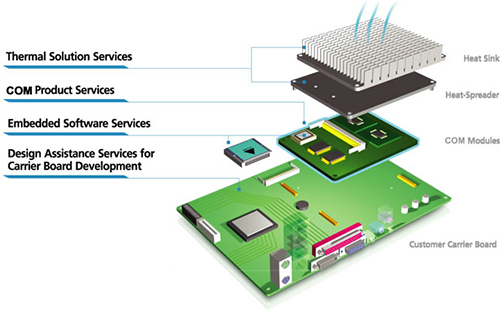 Computer-On-Module, or COM, is a highly integrated board with CPU, chipset, memory, and peripherals designed into a component module. COM requires a carrier board to power up and brings out expansion interfaces and I/O for use. Since the COM architecture provides various standard specifications in different form factors and pin-out types, it not only gives OEM customers flexibility to choose a suitable solution for their applications but also saves development time. The COM standard includes COM Express®, ETX and Qseven, providing a wide variety of interfaces like PCI Express, PCI, ISA, SATA, IDE, USB3.0, etc. These standards cover electrical and mechanical compatibilities for easy replacement or upgrade regardless of the mechanical and thermal design. As a result, COM is one of the most popular choices for customers to design their application-specific solutions.